Author: Michael J. Mitchell, International Coatings Ltd.
04004 Testing of Offshore Systems - Is There a Realistic Testing Scenario or is There Still Work to be done? Much progress has been made in testing of offshore paint systems in the past 10 years. 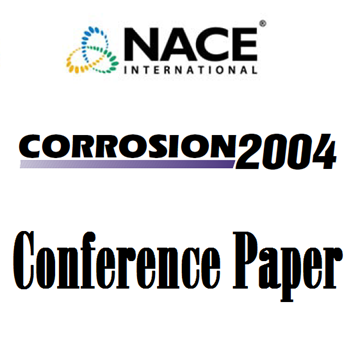 But more work is needed to understand what is happening and give us the confidence to correlate the laboratory accelerated test to the field service life of offshore coating systems. The new NACE Standards are a move in the right direction. Author: Yuly Korobov and Douglas P. Moore, Carboline Co. Author: Cheon Kil Park, Seong Kyun Lee, Ki Hong Kim, and Ho IL Lee, Hyundai Heavy Industries Co. Ltd. Author: Graham Greenwood-Sole and Charles J. Watkinson, Corrocoat Ltd.